How can I edit GoPro Hero 6 HEVC/H.265 video in FCP X smoothly? If you look at the GoPro Hero 6, it's nearly impossible to tell it apart from the Hero 5, even on close inspection.The Hero 6 is the first camera from GoPro to feature the company's custom GP1 image processor, and it looks like a successful debut. There's something important to note at this point. While GoPro's new camera can pump out high-framerate video, it's using HEVC compression for most of the new speeds. Some new cameras support H.265 video recording, such as Samsung NX1, NX500, Panasonic Lumix GH5s, Hero 6; And some device supported H.265/HEVC playback, such as iPhone X, Galaxy S7, LG V30, Google Pixel 2, etc. Can we import and edit GoPro Hero 6 4K 30 fps recordings in FCP X smoothly and without rendering? The answer is absolutely YES. In this case, to have a smooth GoPro Hero 6 recordings workflow on Mac OS X, you'd better convert GoPro Hero 6 4K HEVC/H.265 to FCP X edit-friendly format with proper settings. It will save you both time and trouble, and all you need is to drag the result videos for prompt editing. There are numbered tools and utilities can transcode and compress the 4K footage, few of them can process at a fast speed. Acrok Video Converter Ultimate for Mac is considered to be the best 4K video converting tool. With this powerful HEVC Video Converter, you can convert GoPro Hero 6 30 fps, 60 fps footage to FCP X best editing codec Apple ProRes easily and without losing quality. It is worth mentioning that the GoPro Hero 6 Video Converter can help you get 3D effect. By the way, this software is a good video editor tool too. Download it and learn the step-by-step tutorial. Tip: If you are Windows user and plan to get Apple ProRes video on Windows 10, you need to free download Acrok Video Converter Ultimate Windows version. Please select the appropriate version for you. How to convert GoPro Hero 6 HEVC/H265 video for FCP X on Mac? Connect your GoPro Hero 6 to your computer, run Acrok Video Converter Ultimate for Mac as the best H.265 Video Converter, then click "Add files" to load your 4K MP4 video from GoPro Hero 6 SD card. You can preview your footage via this program. 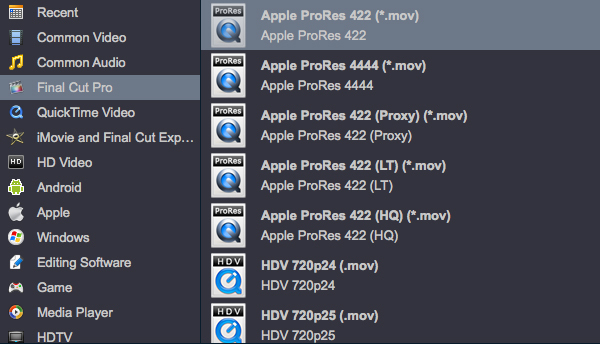 As we know, Apple ProRes MOV is the best editing format for Apple Final Cut Pro (FCP X, FCP 7, FCP 6), so you need to click "Format" bar to choose "Final Cut Pro" category, just select the "Apple ProRes 422(*.mov)". It is just a piece of cake. Tip: For getting 4K resolution video, you need to click "Settings" button to select "Original" in Resolution column. Before conversion, you can click "Edit" icon to edit the GoPro Hero 6 files via HEVC Video Converter. 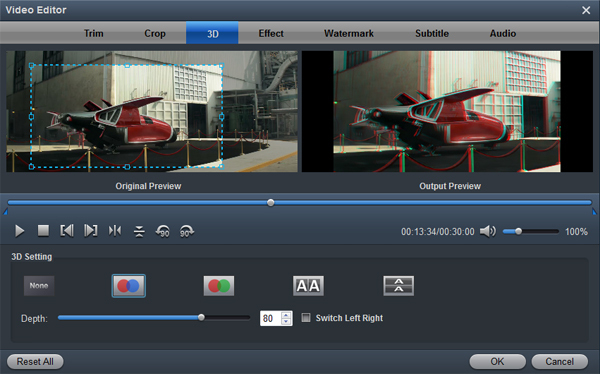 On the "Video Editor" Window, you can play and preview the original video and output effects. Also you can flip video, trim, add 3D effect, reset, and adjust volume. Click the "Convert" button on GoPro Hero 6 to FCP X Converter main interface, you can go to Conversion window to start conversion. After the conversion, you can click "Open" button to locate the converted files. You can edit GoPro Hero 6 video in FCP X smoothly and without rendering. 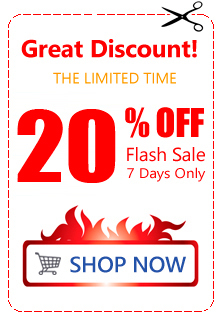 This tool is very user friendly. As soon as I uploaded the 4K H.265 video to this software it instantly converted the file to MOV within a few minutes.